We supply quality in-school and online technology and programming CPD for Teachers, Courses for Home-Schooled Children and training for individuals. Our tutor has been teaching Computer Science and related skills for 28 years, he has also been a software developer for 37 years and running his own software company for 34 years, his experience includes electronics & machine code, various programming languages, computer software development and digital content development for desktop, mobile phones & the Internet. David is also a nice chap who really knows how to deliver a class for any level of learner. NEW: We now offer our fantastic training online. Ask about our online video based courses and live training and mentoring sessions for Teachers. You can easily teach Games Design in your classroom, Ks3 and Ks4 students will love having the ability to create their own games with Gamemaker. If your interest is more for Python then our Python course will get you up and running teaching traditional programming skills using free Python 3 software. For Ks1 to lower Ks4 you might want to learn Scratch. Scratch allows you to easily teach programming methods and concepts in a drag and drop interface. Scratch is easily mastered and can be taught with confidence after a one day course. If you want to produce programs that run on Microsoft Windows which also look like they were designed professionally then our Visual Basic course will quickly get you up and running. This course will allow you to teach the students how to create programs with windows, buttons, menus and all the other graphical items you normally associate with any commercial program. We deliver training in Computer Science, Gamemaker, Python, Scratch, App Inventor, Visual Basic, SmallBasic, Photoshop, Microsoft Word, Microsoft Excel and many more subjects relevant to IT and Computer Science Teacher CPD. Our teacher CPD courses are delivered or at your own premises, in our training rooms, or at hotels around the country. We also run summer camps, weekend, and online courses for pupils and teachers as required. 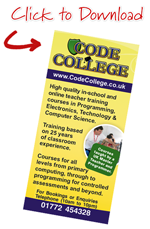 Our trainer has been a professional programmer for 37 years and has been delivering IT and ICT training in schools, colleges, businesses, after school clubs, summer camps, for Age Concern, local Councils and for the Home Office for 27 years.